You really have to stop and ask yourself ‘why?’ Why would anyone want to participate in a parade, when they go over and beyond what your worst enemy would do to you the other 364 days out of the year? Well, meet the repugs of Marathon County; I’m not going to name them in this post (google.com). Whining like some spoiled brats (in adult form) because the members of the Marathon County Labor Council, along with their president Randy Radtke made the decision not to allow the gop to march in this year’s parade. Although I had cheers for this decision, I also have jeers for the future action on this issue by Randy and the council, which I will discuss later in this post. Now think about this, you are the president of the county ‘labor’ council who for decades has been the lead organizers for the event. Making the decision to stand-up for the working men & women in the county and the state, it immediately went national. Yes the media was eating this stand-off up in huge chunks, the ‘working-class’ was showing some courage after being pummeled all year. In fact, every since February 11, 2011 when the details of the so-called ‘budget -repair bill’ was released, labor in Wisconsin has been on the defensive. Voluntary concession were made by all public sector unions, including the educational community which consists of teachers, support staff, higher education faculty / staff, etc., just to keep collective bargaining for the ‘working class.’ The operatives of ALEC had won! Collective Bargaining the way Wisconsinites had known it for over 50 years was gone. However, I am going to take us ‘back-to-the-future’ on Monday, September 5, 2011 the Marathon County Labor Day Parade will have republican legislatures marching among supporters of labor. It amazes it me to think that so many people see the Labor Day holiday, as a day to celebrate the end of summer. People you are wrong, totally wrong! Many years of blood, sweat, and tears has been shed for this day to celebrate labor. After the president of the Marathon County Labor Council announced that the republicans would not be allowed to participate in the parade, the labor movement felt a ‘momentary’ surge of power. However, the pressure placed on Randy and his family, the council withdrew their decision to prevent the republican right-wing nut jobs in the parade. Mayor Tipple’s threat to withdraw logistical support like police, stage set-up, and audio equipment added to the decision. I really believe that labor organization across the globe would have contributed to the cost, if only the council had reached out to its brothers and sister in and out of the labor movement. Although, I am pissed off about the change of mind to allow these nut jobs to march in the parade, I have to applaud Randy for not dragging the community, school bands, and closet supporters into making the tough decision to participate or not. Nevertheless, I will be in attendance at the parade, not sure if I will go with the strategy being floated around of turning my back to the right-wing nut jobs or wearing ‘brown bag’ like the fans use to do for the hapless Saints back in the day or what. I salute the men and women of labor, professional, non-professional, hourly, salary, full-time and part-time for your contributions to the labor movement and the many benefits we all enjoy around the world. You rock! A very thorough summation of the state of mind of progressives, the day after the recall elections in Wisconsin. As I have done in the past by highlighting a great member from the world of bloggers / activists. Here is Bluecheddar from Madison, Wisconsin — Wisconsin the day after. I would further add to this piece the victories by the Dems in winning senate district’s 18, 32 which are clearly republican strongholds in the state of Wisconsin. Jessica King and Jennifer Schilling my hat’s off to you our newly elected senators. Defending Holprein – SD-12 and Wirch, SD-22 is the next phase in our efforts. It has become abundantly clear who and what is the mindset behind not only the Voter ID strategies, but union-busting and the likes. Conservative Corporate Advocacy Group ALEC Behind Voter Disenfranchisement Efforts – Campus Progress. There is also a resource ALEC-Exposed that goes into depth about the plans of this group, working on legislation across this country on a variety of areas and with the Murdoch ‘tap-tap’ could be global. People this is a plea for you to wake-up, this country is under attack and it is not only from a group of radicals from abroad, but it right here in our own government. The gop / tea party is so set on seeing that President Obama fails, that they would let the country go into default in order to make it happen. Minority leader McConnell claimed that the President would be a one-termer.And the debt ceiling stalemate is part of that great plan. Remember: this is the party that ran on ‘jobs’ in 2010, has there been any bills introduced that will create jobs? None! Please don’t get me wrong, I am not happy with the way the President is running his part of the government. But, I would not want to fathom what things would be looking like if it were President McCain. 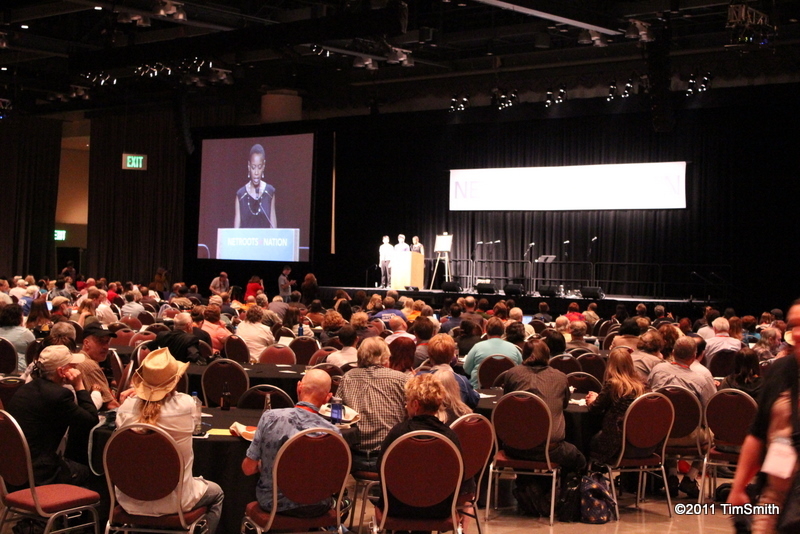 This is my first Netroots Nation conference and I must say I leave feeling very impressed, but also pretty overwhelmed. Being surrounded by so many people who blog for a living or just getting their message out to the masses had my head spinning. Techniques that were shared in several of the sessions I attended made me want to run out and write about the conference. Being somewhat of a neophyte to the world of blogging, it was pretty damn cool networking with the powerhouses of the blogosphere and picking their brains on best practices has given me more confidence to tell my stories. The sessions ranged from storytelling to getting technology into poor areas just to name a few. 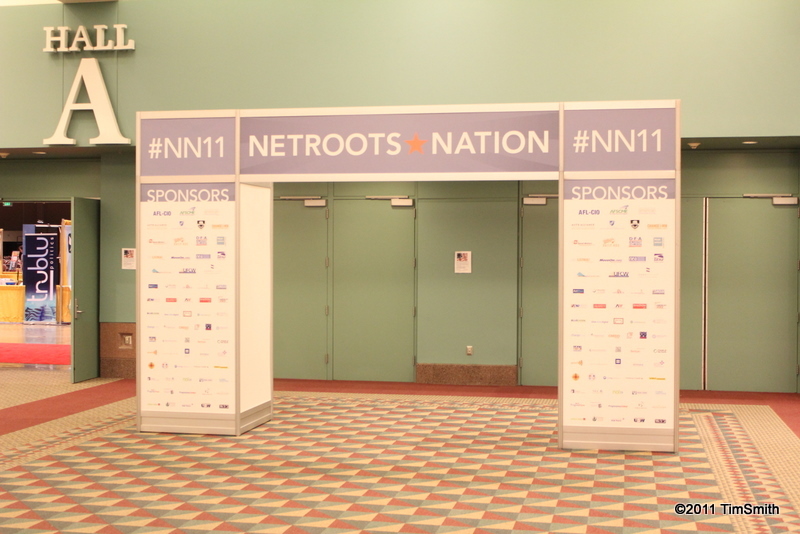 If you don’t know about Netroots Nation, it was started a few years ago during the Howard Dean ‘fifty state’ strategy to become the President of the United States. The strategy was to pull progressives, new school liberals together using social networking as a medium to connect people all across this country and across the world for that matter. The movement took a life of its own and this week-end the conference attendance was the highest one to date, 3000. These people care about what is happening to our country and they want to restore the American Dream, so let’s work hard to make this happen. Next years conference will be held in Providence, RI the goal is to double this years numbers. I hope to see you there! ALEC: The Voice of Corporate Special Interests In State Legislatures | People For the American Way. It has come to the surface, the true brain-trust has been exposed. Yes, ALEC a group that has been in existence since the early ’70 has a huge plan that is happening every day. It is a recommended bookmark, favorite you name it, but you will want to get in action to fight this massive bliss that we are currently facing. This is not a video, you can pick the area of your choice a read with amazement. In a great article, Synecdoche Wisconsin by Bo Winegard a student at Grand Valley State University, planning his graduate work at Florida State University and study social psychology. Glance at ‘the voice’, then get a good grasp of how this ‘phenomenon’ all has evolved, just think a 41 year project in the making… He gives a very thorough accounting of the evolution of the ‘neoliberalism’ movement. I am happy to feature Brother Keith Balmer’s reflections on the state of America today. A very good read!!! It\’s Class Warfare As The Rich Gets Richer – Keith Balmer: The Dark Prince of Satire.